The term Context refers to connection, coherence in discourse, also, interrelated conditions in which something exist or occurs (Winegar and Valsiner, 1992). According to relational meta-model as propounded by Damon and Lerner (2008) human development can be understood by analysis of integral individual-context as he or she cohabit in respective level multiplicity of operating factors including family, school, traditions, media and legal system. Similarly, in the Tanzanian Constitution and the United Nations Convention for rights of children as dictated in Child Development Policy in Tanzania (URT, 1996) “a child” is a person below eighteen years old and his/her development is a function of physical, intellectual, moral and spiritual growth (URT, 1996). 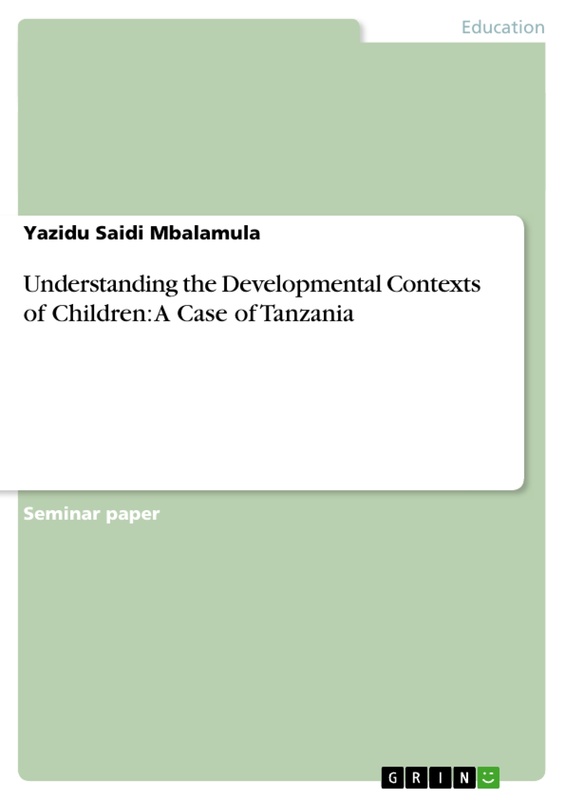 The child development policy also shows that children make an important segment of the Tanzanian society constituting about 46% of the approximately 46 million population. Studies show that in order for a child to grow well, she/he needs to be cared for, given guidance, and brought up in accordance to norms of the community. 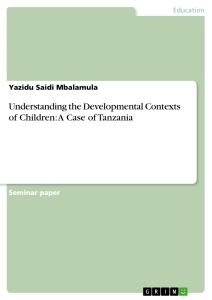 Therefore, the gross conceptualization of children in any given time and space can best be understood by accounting respective contextual factors as will be discussed there-after in this paper. The discussion will provide a descriptive understanding of important issues for assuring and guaranteeing the well being of a child development. In the view of Development science, the development of individual child can be studied by accounting developmental system theoretical assumptions, which provide analytical explanations about the respective individual beyond the self, where by and large, physical and social ecological aspects are inclusive and significant to constitute platform in which human development occurs (Damon and Lerner, 2008). Similarly, Brenfenbrenner (1979) argues that “to study the child without understanding the context is to not fully understand all of the factors that affect the child”. In addition, developmental context can be used amongst others as a proxy to organize and account for understanding the operating factors, such as physical and social-ecological aspects which are sources of inevitable changes occurring in the three fundamental domains of human development encapsulated in Physical, cognitive and emotional-social parameters (Zanden et al, 2007). The ecological approach which is also used to explain child development in this paper, is grounded to the theoretical assumptions that children’s development is nonexistent, and must account the children’s interactions with the environment, that is, the children’s changing physical and social settings, the relationship among these settings, and how the entire process respond to societal forces in which the settings are embedded (Brenfenbrenner, 1979; Zanden et al, 2007). Moreover, McGuire and Shanahan (2010) add that, indeed, the ecological perspective describes the multiple embedded layers of context, including Microsystems (e.g., daily settings and relationships) to Meso systems, also Exosystem (e.g., connections among Microsystems such as school-home interface) and Macro systems (e.g., societal and cultural beliefs). In addition, as can be derived from the diagrammatic representation of the Ecological theoretical model given above (See figure 1), Brenfenbrenner (1979) and McGuire and Shanahan (2010) assert that the ecological layers that are inner and close to the self or individual entity, both shape and are shaped by more distant macro systemic layers. Therefore, family, siblings, school, peers, mass media tend to dominate the closest proximity to individual child development, and thus, their considerable effect presents significant magnitude in children life time’s behavioral change; this observation does not, however discredit the effect of laws, historical and social conditions, economic trends and culture of particular country in which particular children grow.